The village of Monchy le Preux was scheduled to be captured on the first day of the Battle of Arras but was not taken for several days after heavy fighting and a costly – and rare – cavalry charge. The men of the Newfoundland Regiment took over the village and defended it against a German counter-attack on 14th April 1917, it becoming one of their major battle honours and one of the reasons leading to them becoming a ‘Royal’ regiment. This image comes from a small album of photographs taken by a British Gunner veteran who returned to the Arras battlefields where he had fought in the 1920s. 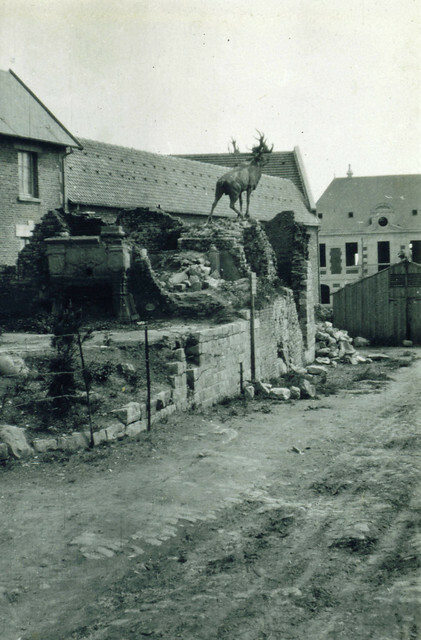 It shows the Newfoundland Memorial – a Caribou – mounted on a British observation pillbox, itself built into an old house. Around the memorial the village is rising from the ashes – beyond it the as yet incomplete mairie can be seen, for example. The memorial is one of five similar Caribous placed on the key battlefields where the regiment fought in WW1; a sixth is in Newfoundland itself. This entry was posted on 13/04/2012 by sommecourt. It was filed under Arras, British Army, France, Great War, Hindenburg Line, War Memorial, Western Front, WW1 and was tagged with 1917, Arras, Arras95, Hindenburg Line, Monchy le Preux, Newfoundland, WW1. in New Mexico USA does anyone know how I could verify this?